There is a debate current among students (I decline to call them scientists) of cognition and artificial intelligence about (1) whether the human brain is just a computer – albeit a very complex computer – and (2) whether a computer can ever truly replicate a human brain. To see how vacuous this idea is, consider the brains of babies. Thanks to evolution, human neonates, like the newborns of all other mammalian species, enter the world prepared to interact with it effectively. A baby’s vision is blurry, but it pays special attention to faces, and is quickly able to identify its mother’s. It prefers the sound of voices to non-speech sounds, and can distinguish one basic speech sound from another. We are, without doubt, built to make social connections. …..
………… Senses, reflexes and learning mechanisms – this is what we start with, and it is quite a lot, when you think about it. If we lacked any of these capabilities at birth, we would probably have trouble surviving. I would frame the issue somewhat differently. The human brain is not like a computer but we need to understand the differences. Comparison of the operations of a human brain with that of a computer can, I think, be very revealing. It is almost self-evident that the human brain is born with two operating systems in place. There is one operating system which is based on logic and reason; a rational operating system. Causality rules. This is what we also build into our computers. But all humans, from birth, also have an emotional operating system in place. This is not opposed to reason but lives on a different plane. It is arational rather than irrational. I take emotions to be a consequence of consciousness and result as judgements based on a perception of the self relative to the world. Whether fear or anger or pleasure or contempt, emotions represent a current judgement of the position of the conscious self in and relative to the world. Our emotional operating system constantly assesses our current state. 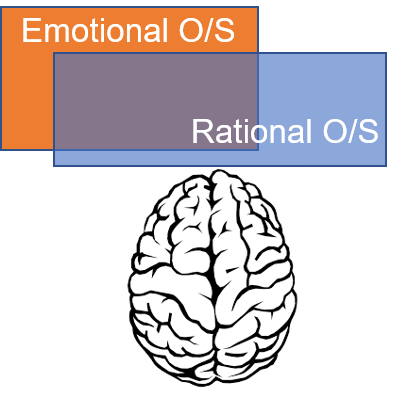 On the emotional plane causality is incidental and logic is irrelevant. I observe that animals also have differing levels of consciousness and correspondingly different levels of emotion. They also, it would seem, have two operating systems in place. I observe, in my own behaviour, that in very similar situations where reason would demand the same response, my emotional operating system can override reason and create a different response. I observe also that reason is often in command over my behaviour and that my emotions are then suppressed. But it is also apparent that emotions and reason operate largely independently and in parallel. They are not completely independent and do, it seems, “touch base” from time to time. The basic version of our emotional and rational operating systems would seem to be established by our genes at birth. They are “smart” systems capable of being updated as we grow but cannot be completely rewritten. They develop as our bodies and our brains develop. But what is unique to the living brain is that the two systems operate simultaneously. In every individual they achieve a balance which determines the thresholds when the one is subordinate to or overrides the other. Where some working balance is not achieved it shows up as internal stresses or psychoses. Computer systems have been developed to “read” human emotions but no computer system has been imbued with the ability to feel emotion. That cannot happen until a computer system has developed some level of consciousness. But the corollary is that any computer which develops some level of consciousness will be capable of feeling emotion. I come to the conclusion therefore that a computer will not resemble a human brain until we can imbue it with consciousness and – as a consequence – with emotions. This entry was posted on August 1, 2018 at 10:17 am and is filed under Brain. You can follow any responses to this entry through the RSS 2.0 feed. Both comments and pings are currently closed.